Commitment towards innovation, the ability to collaborate, build alliances and networks, and make impact in a sustained manner, have been listed as some of the strategic “warfare” startups and young non-profits must have, in order to meet changing conditions in the 21st Century non-governmental sector. NGO stakeholders reached this consensus as a panel session on Civil Society Organizations: Synergies, Partnership and Amplified Civic Engagements (CSO-SPACE Nigeria) held at the international conference of the Association for Research on Civil Society in Africa (AROCSA). 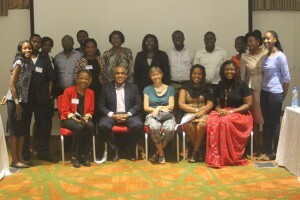 The Association for Research on Non-Profit Organisations and Voluntary Action (ARNOVA), with support from the Ford Foundation, organized the 3-day conference in Lagos, between May 19-21, 2016, to create a platform for knowledge-generation, meaningful interactions and collaborative action among African scholars, researchers, practitioners, business and policy makers propelling development on the continent. The CSO-SPACE panel session featured vibrant presentations and experience-sharing by a diversity of experts and leading practitioners in the Nigerian civil society movement. The panel of experts comprise of Ayo Obe, a Legal Practitioner and partner in Ogunsola Shonibare law firm; Edewede (Dede) Kadiri, a senior professional with multi-disciplinary background in the public, private and social sectors with specific work experience in research, policy analysis and system architecture; Charles Abani, currently the Chief of Party at Chemonics International; and Monika Umunna, a programme manager for the “Inclusive und Sustainable Megacity Lagos” programme at Heinrich Böll Stiftung, while Victoria Ohaeri of Spaces for Change moderated the session. Participants were drawn from 10 non-governmental organizations (NGOs) consisting of 5 start-ups (2-5 years) and older NGOs (10 years and above), selected on the basis of their experience, challenges and different levels of success/setbacks. Civil Society Organizations (CSOs) are having a larger impact on the way societies operate than ever before. They have become key drivers of policy, working together with the government at all tiers to provide new ideas that help address shared challenges around response, transparency, accountability and other elements that contribute to strengthened democracies and a better quality of life. Many civil society actors acting in a non-profit and non-governmental capacity are experiencing severe challenges owing mostly to the dwindling international donor funds and fewer social sector skills and mentorship. This scarcity has cultivated a less than optimal civil society space in the country: fewer social sector partnerships and collaborations; weak interdisciplinary and professional networks; suspicion and mistrust; gate keeping; resulting in a lack of institutional sustainability marked with stunted growth. One effect of the current climate and professional culture is a weakened succession planning. Not only has this created a huge disconnect between younger and older generations of civil society actors, but it has also constrained consistent experiential mentoring, practice-based exchange and internships under seasoned practitioners. With the objective of strengthening start-up NGOs, research institutions and advocacy groups, the CSO-SPACE session centered on the resource challenges they face in Nigeria. Along these lines, the three focal points of the panel discussion ranged from growing strong and effective institutions; deepening partnership, collaboration and value through knowledge and skills transfer to building strong institutions through the development of models. Leaders of pioneer NGOs were there to give wise counsel and share their experiences with the younger leaders of start ups and smaller non-profit organizations. They provided deep insights into deliberate and concrete steps organizations need to adopt in order to grow strong institutions and achieve long-term impact/sustainability. (A) How can young CSOs gather influence? Know the issue/remain focused with the intent to add value, and solve problems. How? Take action (public campaign, research, etc) keep updated on the main issue to be addressed. They must basically “know their stuff”. Create legitimacy (Need to be and remain important). Address gaps and make connections. Become good at what you do. Demonstrate how you are different. Watch how the (your) space is evolving? (B) How do donors fish out organisations doing credible work? Organisations with new ideas that will contribute (not reinventing the wheel) to the donor’s area of priority/interest (issue). Innovative solutions- It’s about change/making impact not “input”, “output”. Not implementing programs without change. (C) How can NGOs build strong institutions? Collaboration and partnership is very important. It is not competition; it is not about who wins but about making impact, building alliances and networks. Remain relevant by moving about to learn and adapt new things. Do not remain in a position for too long. Learn from failures/ challenges, listen to criticism and learn. Visibility is important, but not the goal. CSO SPACE is a collaborative initiative led by female development practitioners in Nigeria. It seeks to position itself as a key node and resource point where an enhanced networking and learning environment may emerge.